The Alhambra Faint Object Spectrograph and Camera, ALFOSC, built at the Astronomical Observatory (AO) at the Niels Bohr Institute for Astronomy, Physics and Geophysics (NBIfAFG), is the property of the Instituto de Astrofisica de Andalucia (IAA), Granada, Spain. The NOTSA has an agreement with the IAA and AO for the loan of ALFOSC. We at NOT are extremely grateful to the IAA and its Director Dr. Rafael Rodrigo, and the AO for the loan of this instrument and the collaboration it has established. All publications resulting from or containing ALFOSC data should acknowledge the Instituto de Astrofisico de Andalucia and the Astronomical Observatory, Niels Bohr Institute for Astronomy, Physics and Geophysics in a format described here. 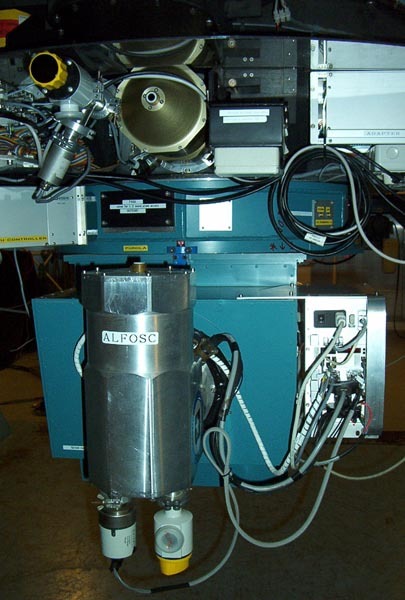 ALFOSC has a field of view of 6.4x6.4 arcminutes in imaging mode, and can also be used for low/medium resolution spectroscopy, and polarimetry. Possible spectroscopic upgrades: VPH grisms, etc.